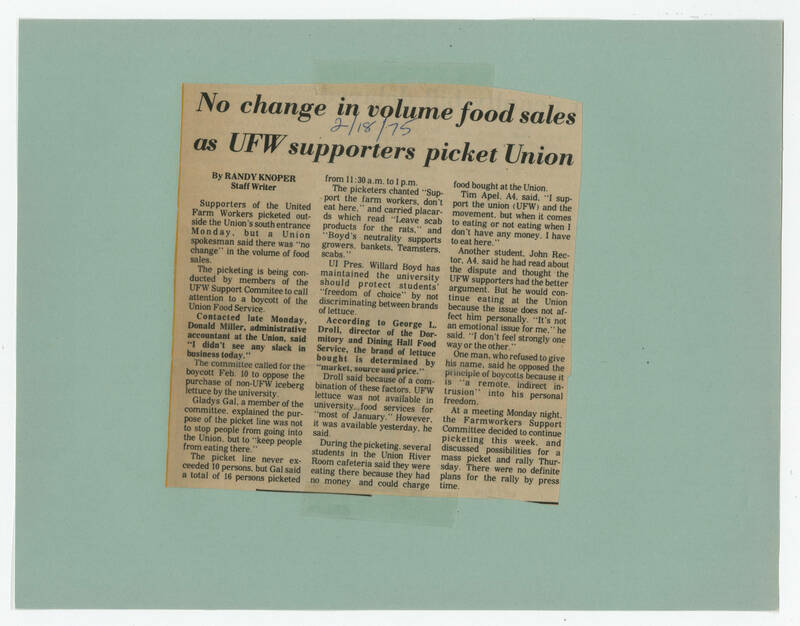 [[Header]] No change in volume food sales as UFW supporters picket Union [[end header]] [[Handwriting]] 2/18/75 [[end handwriting]] [[Bold]] By RANDY KNOPER Staff Writer [[end bold]] [[Article text]] Supporters of the United Farm Workers picketed outside the Union's south entrance Monday, but a Union spokesman said there was "no change" in the volume of food sales. The picketing is being conducted by members of the UFW Support Committee to call attention to a boycott of the Union Food Service. [[bold]]Contacted late Monday, Donald Miller, administrative accountant at the Union, said "I didn't see any slack in business today." [[end bold]] The committee called for the boycott Feb. 10 to oppose the purchase of non-UFW iceberg lettuce by the university. Gladys Gal, a member of the committee, explained the purpose of the picket line was not to stop people from going into the Union, but to "keep people from eating there." The picket line never exceeded 10 persons but Gal said a total of 16 persons picketed from 11:30 a.m. to 1 p.m. The picketers chanted "Support the farm workers, don't eat here." and carried placards which read "Leave scab products for the rats," and "Boyd's neutrality supports growers, bankets. Teamsters, scabs." UI Pres. Willard Boyd has maintained the university should protect students' "freedom of choice" by not discriminating between brands of lettuce. [[bold]]According to George L. Droll, director of the Dormitory and Dining Hall Food Service, the brand of lettuce bought is determined by "market, source and price. "[[end bold]] Droll said because of a combination of these factors, UFW lettuce was not available in university food services for "most of January." However, it was available yesterday, he said. During the picketing, several students in the Union River Room cafeteria said they were eating there because they had no money and could charge food bought at the Union. Tim Apel, A4, said, "I support the union (UFW) and the movement, but when it comes to eating or not eating when I don't have any money, I have to eat here." Another student, John Rector, A4, said he had read about the dispute and though the UFW supporters had the better argument. But he would continue eating at the Union because the issue does not affect him personally. "It's not an emotional issue for me," he said. "I don't feel strongly one way or the other." One man, who refused to give his name, said he opposed the principle of boycotts because it is "a remote, indirect intrusion" into his personal freedom. At a meeting Monday night, the Farmworkers Support Committee decided to continue picketing this week, and discussed possibilities for a mass picket and rally Thursday. There were no definite plans for the rally by press time.